Multiple Paths to Literacy 8 Edition In this highly regarded resource, pre- and in-service teachers see how to recognize students’ literacy strengths and needs, identify students with special needs, and plan and differentiate instruction. 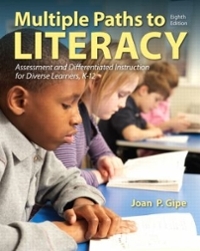 With a goal of making literacy accessible to all students, and taking into account each learner’s talents and multiple intelligences, the book helps teachers meet the literacy needs of the diverse learners in today’s classrooms. Included are discussions for helping readers connect instruction to the Common Core State Standards, understand the relationship between the analytic process and RTI, work successfully with English Language Learners and students with special needs, more easily explore relevant websites, and more. A number of helpful pedagogical aids are included to ensure comprehension of the important ideas—among them Spotlight on English Language Learners, Arts Connection, MI margin notes, vocabulary alert, chapter objectives, assessment resources appendixes, and a glossary. Multiple Paths to Literacy provides the perfect combination of analytical approach and practical strategies in a new edition that is updated and more accessible than ever.